The exclusive neighbourhood of Mont'Kiara will soon have a new residential landmark – Trinity Pentamont. This 41-storey condominium which has a Gross Development Value (GDV) of RM437 million, is built on a 2.9-acre plot of Freehold land and features 330 penthouse-styled 4+1 bedroom and 5+1 bedroom units sized from 2,057 square feet onwards. Located along the quiet enclave of Jalan Kiara 5, Trinity Pentamont will feature a dual entry and exit access via Jalan Kiara 5 and Jalan Kiara 3 and will boast excellent accessibility with connectivity to the PLUS Highway, Sprint Highway and the Jalan Duta – Sungai Buloh highway. Trinity Pentamont, which is a hybrid of the words “penthouse” and “Mont Kiara” is touted to be a game-changer in the property industry by creating a new category of residential development which truly deserves a class of its own. Designed for today's modern families who wish to have quality and flexible family-sized homes, each unit is crafted with liberating spaces and well-planned designs to create a living experience usually reserved for residents of penthouses. “Finally, with built-up areas of more than 2000 square feet, Trinity Pentamont is BIG on space too – with unit sizes much larger than other developments in the vicinity. This is a rare opportunity for buyers to grab a penthouse-sized unit at this price,” he added. Aside from the residential units, Trinity Pentamont is also touted as the first adventure- themed development in the Klang Valley, with facilities that include a 7-metre Cascading Falls, Hanging Tree Nest, Tee Pee Tribe, Starlight Theatre, Celebrity Kitchen, Chill & Grill, Junior Rock Climbing, Infinity Edge Pool and many other exciting facilities. According to Dato' Neoh, the project will be targeted at upper-middle class families with children. “As Trinity Group's latest flagship project, Trinity Pentamont encapsulates our belief for luxury living,” said C.Y. Ng, Chief Marketing Offer at Trinity Group. “The development philosophy of this project is to create a refined living experience that offers our customers luxurious space with top of the line facilities for them to create meaningful moments with their family members and loved ones. We spend the best moments of our lives with our families in our homes. Everything that we do at Trinity Pentamont is meant to enhance the experience,” she added. Trinity Pentamont is also conveniently located near a plethora of F&B outlets, shopping centres, schools and hospitals, all located within a 3-kilometre radius. It is merely minutes away from these amenities and lifestyle conveniences including Verve Shops, Plaza Mont Kiara and Hartamas Shopping Centre, Garden International School, Mont Kiara International School, French International School. The project is also close to hospitals like Global Doctors Hospital, KPJ Damansara Specialist Hospital and ParkCity Medical Centre and leisure spots such as the Kuala Lumpur Golf and Country Club, Bukit Kiara Equestrian Club and Royal Selangor Club. Trinity Pentamont, which is scheduled for completion in 2022 is developed by boutique property developer, Trinity Group, known for its strong following and reputable track record of developing a number of notable residential properties in recent times, which include Trinity Lemanja @ Kepong, Trinity Aquata @ Sungai Besi, The Zest @ Kinrara 9, Z Residence @ Bukit Jalil, Zeva @ Equine South and 19 Residency in Bandar Bukit Puchong. 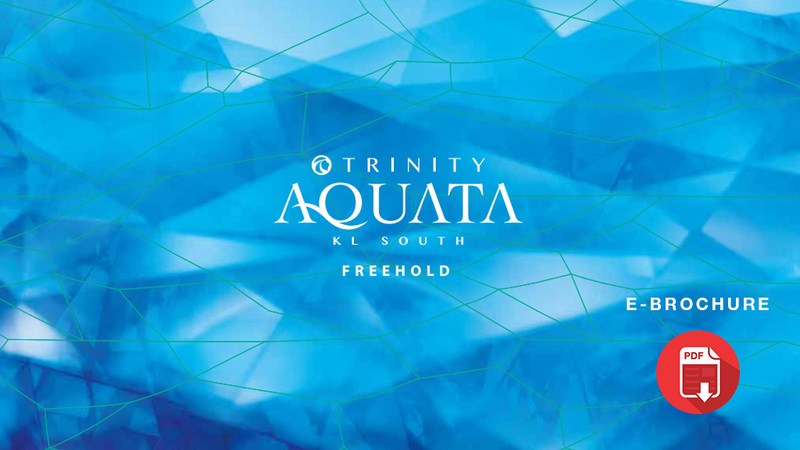 The developer is also gearing up for the handing over Trinity Aquata to its buyers by the end of 2018, the development which has seen a favourable take-up rate of 98%, was initially targeted for completion by mid-2019, will now be handed over ahead of schedule. Register your interest with us to receive updated info on our upcoming developments.